The NucleoCounter® NC-200™ is a high precision automated cell counter utilizing state-of-the-art image cytometry. The patented Via1-Cassette™ used for automated staining and sample handling is volume calibrated to ensure high precision and reproducibility. With user adaptable protocols and specialized assays for aggregated cells and cells on microcarriers, the NucleoCounter® NC-200™ provides an all-in-one solution for cell counting and cell viability determinations. 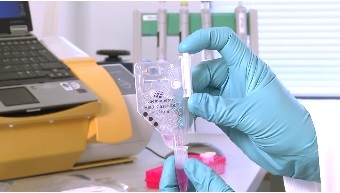 Using the automated cell counter NC-200™ is a simple 3-step procedure- loading the cassette with cell suspension, inserting the cassette into the NucleoCounter® NC-200™ and pressing the RUN. 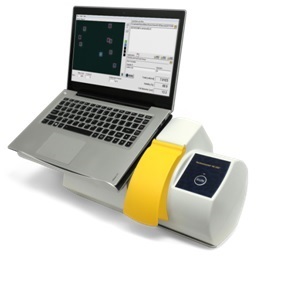 The results are automatically stored in the accompanying Nucleo View™ software and can be assessed anytime. The Via1-Cassette™, includes an in-built pipette and the immobilized fluorescent dyes acridine orange and DAPI automatically stain the total and dead cell populations, respectively. The instrument’s fluorescent microscope acquires a green and blue image for detecting live and dead cells. The large counting chamber which corresponds to 14 fields in a traditional hemocytometer, ensures high statistical performance when the NucleoView™ software calculates the cell concentration.